Download Link: Look at bottom of article. 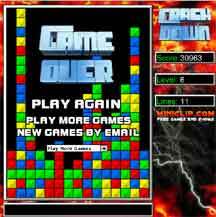 Crash Down is a variant of the very popular game where you click the blocks when 3 of the same color blocks are next to each other. After you click one of the 3 same colored blocks that are next to each other they disappear. The object of the game is to keep the blocks from reaching the top (because more blocks are added every 5 seconds or so). The only difference in this version of the game is that this one is free:-) and free is always better in my opinion. First, I would like to say that this game is really hard. The levels get harder and harder as you go on, and this game seems to be a little harder than other versions I have played. Other than that the game is great and the music is quite good too! So in conclusion, this game may cause you to spend hours sitting in front of your computer's monitor, LCD screen, plasma screen, etc. NOTE: On the site that this game comes from, there are a few things that people around 12 and under maybe shouldn't be looking at. I haven't checked the actual things out and your preferences may be different from mine, so don't say you went there and you saw nothing a little inappropriate. Because of this I do not have a direct link to the main page of the site.